SK Kpg Buda that plunged into the river on June 8 – let it be a reminder to those who shouted ‘Merdeka’ to reflect on what we have in Sarawak and Sabah. IT’S August 31. Merdeka, Merdeka, Merdeka were splashed all over the newspapers in the peninsula. Indeed, images and comments of Independence Day have been widely publicised, all with the hope to unite Malaysians by reminding them of how momentous a day August 31, 1957 was. My good friend alerted me to a column in a Chinese national newspaper, saying it was a classic case of some “pathetic Malayans” talking about their independence of 59 years and the road to progress they had travelled – notably from dilapidated to modernised schools – yet forgetting or ignoring Sarawak and Sabah altogether. The columnist delved into the miserable toilet conditions of the schools in Malaya he went to over 40 years ago which put students off answering Nature’s call, probably resulting in the columnist himself suffering from piles in later years. His words superseded the saying – a picture is worth more than a thousand words. And thumbs-up for the vivid description albeit a little too personal to share here! “In Sarawak, we still have schools existing under the sort of conditions the columnist experienced over 40 years ago,” my friend rasped. I could feel his blood boiling – and yes, my blood pressure could have also surged a bit higher as I read the columnist’s masterpiece. Any Anak Sarawak would have felt the same, for that matter. 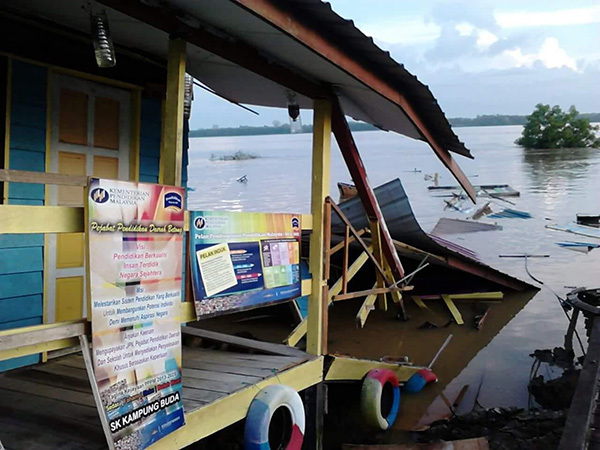 On June 8 this year, while the YBs were attending the opening day of the DUN sitting, news broke that a nursery and surau of a primary school – SK Kampung Buda – in Spaoh, Betong, were swept into the nearby river after the ground beneath them collapsed due to erosion. It was the second “unceremonial dumping” the school had been subjected to, yet nothing, thus far, has been done to prevent a possible third plunge. Prime Minister Datuk Seri Najib Tun Razak may have expressed grave concern in his Twitter and Facebook accounts over the dismal conditions of another rural school – SK Sungai Ladong – at Sebuyau where 20 teachers and 169 pupils had to teach and learn in unsafe buildings due to soil erosion. But what and how much is his government going to do about it is left to be seen. He came and went. And probably during the next state election, Sarawakians will get another round of sympathies for sending their children to such unsafe schools. What choice do they have? SK Sungai Ladong was built in 1957 (incidentally during ‘their’ Merdeka Year) with five building blocks, a pre-school building and teachers’ quarters. Will it shock the columnist to know that the dismal conditions of the school in the peninsula he attended and described over 40 years ago are still more or less the same today in Sarawak and Sabah? These are just two “classic” examples of the atrocious conditions of our rural schools. According to the Auditor-General Reports 2014, released in the last quarter of 2015, a whopping 388 out of 1,452 schools in Sarawak are in a state of disrepair with children studying in either rotting or termite-infested buildings or schools on the verge of collapse due to soil erosion. There are two schools – SK Sebako and SK Jangkar – in Lundu, less than two hours’ drive from the capital city, which have been found unsafe during an inspection on July, 10 2013, but no remedial action has been taken as at March 31, 2015. Sarawak has, indeed, a long way to go before it can be on par with Peninsular Malaysia, Chief Minister Datuk Patinggi Tan Sri Adenan Satem said in his address at the state-level National Day (Aug 31) celebration. “We no longer wish to have schools that plunge (terjun) into the river, schools with no 24-hour electricity and schools that can only be reached by dirt or muddy roads,” he stressed. He also revealed that the state government has approved an allocation of RM1 billion, being disbursed for the period of 2015-6 to provide infrastructure facilities and basic amenities for the rural areas. Macam menunggu sungai tidak berhulu is the Malay idiom he used to describe the often agonising wait for much-needed allocations from Putrajaya. Seems like a wait in vain! Lawmakers from the peninsula have travelled the road from dirty to modern water-borne sanitation and small roads filled with potholes to highways, yet many parts of Sarawak have seen little, if any, development over the past 53 years. Truth to told, we have not taken off! I wish to invite those politicians and writers from the peninsula who call Malaysians ungrateful for highlighting the inequitable state of development in the country. Let these people travel the road they have not travelled before and see for themselves the devastating effects of soil erosion, decaying wooden and obsolete steel structures, worn out concrete, broken down sewage systems, damaged walkways, termite infestations, leaking roofs and ceilings, faulty drains and out-of-date electrical wiring systems of the schools here. This should open their eyes to gross negligence of the needs of Sarawak and Sabah and how opportunities, security and future of the affected children are being compromised. There are different interpretations to the poem – the most common is using the last lines as our thoughts of independence, uniqueness and taking the roads that others have not taken to make a difference that means a better, more meaningful and happier future. Taking the second stanza – Oh, I kept the first for another day – I thought to myself the traveller decided to leave the other path to take another day. It’s always fascinating to look back and wonder what other roads we did not take. Will it be equally good or even better? Do we have a chance to take the other road another day or will that time ever come? Yes, it’s September, the kind of September before September 16 (1963) when life was slow and mellow. Previous ArticleBack to the future?